A short experimental film in the form of a home movie created by Merlin the sorcerer, who lives in a cabin in the woods. Dressed in a hooded robe with a long white beard, Merlin spends the day making potions and stews while remembering the young king Arthur. Jorge Núñez is an artist, filmmaker and musician based in Bilbao. Besides his film and performance work, he also runs Pantalla Fantasma, a festival of strange cinema, and is the editor of the film blog Fuerza Vital. 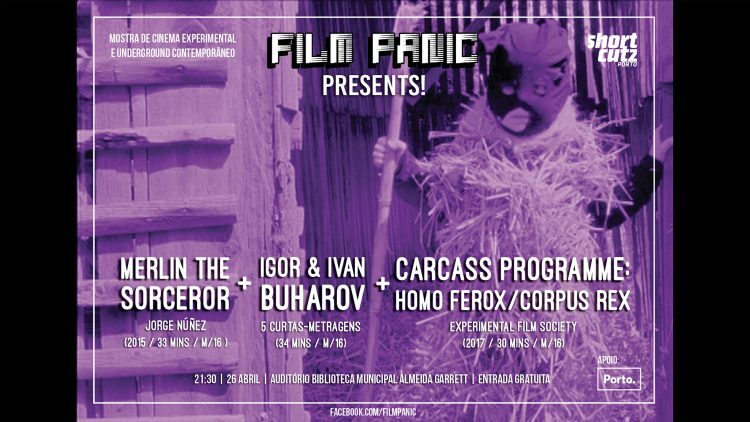 A selection of short films by Kornél Szilágyi and Nándor Hevesi, aka Ivan and Igor Buharov, two Hungarian artists whose long and productive collaboration manifests in the creation of experimental films, animations, documentaries, musical projects, performances and exhibitions. For this screening we present five of their short Super8 films which feature a cast of enigmatic characters engaged in a series of surreal games and personal rituals. Set against the backdrop of the Hungarian countryside, the Buharovs have created a mythic world which is equal parts dark and humorous, mysterious and subversive.